I’ve returned from a visit to the USA and returned with fresh ears. The Islandia mixes are sounding fantastic. There’s still a way to go before the album’s release, so, in the meantime, I thought I’d write the penultimate journal entry from this “making of” series. 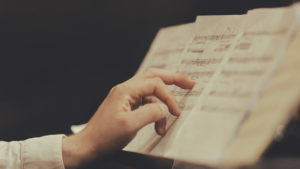 With ever-diminishing recording budgets stretching across all genres of music, time management is one of the most significant — if not the most significant — contributing factors to the success of a recording session. 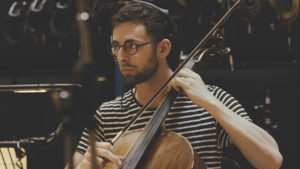 “Failure” isn’t really a term applicable to any recording session (although “catastrophe” might be appropriate on the rare occasion); there are only ever-increasing degrees of accuracy between what the composer, producer or artist has in mind and the audible result. A big part of bridging the gap between intention and result is time management. Good time management will ensure you record the best performances possible within the given timeframe, reduce stress and pressure-induced errors, keep a recording on budget and will make for an enjoyable experience. At its heart, recording is something that should be enjoyed; it is a process by which the creative output of an artist and their influencing factors (be they social, governmental, economic, or otherwise) are committed to stasis; an audible form in which time is preserved and, though it may infer new meanings in the future, is representative — for eternity — of a time, place and moment in the life of those who created it; it is this moment that is shared with audiences and interpreted by them, and — internally — made their own. There will always be a degree of pressure during recordings, especially for performers, but it is a mistake to jeopardise your enjoyment of a recording session through failure to prepare and manage time properly. I’ve produced and overseen recordings for nearly a decade, but due to the complexity of Islandia and our limited recording time, I had to pull a few extra tricks out of the bag, including Skype rehearsals and pre-recording the guitar and synth parts. This simply means I performed the guitar and synth parts before the main recording session and amplified these perfected takes at Abbey Road, whilst recording the input from the amplifier. For some instruments, like electric guitar, this is a brilliant way to speed up recording sessions, provided you’ve a good degree of control over how the signal is altered during re-amplification (I’d recommend this box of tricks by Little Labs for this purpose). Refining the phrasing and colour of music is, for me, as a performer, what music is all about. 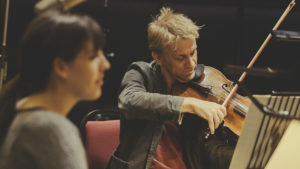 It is the time when you connect with the music, its message and communicate something of yourself through it; it is an experience, not a process, and part of what makes music such an awe-inspiring force. 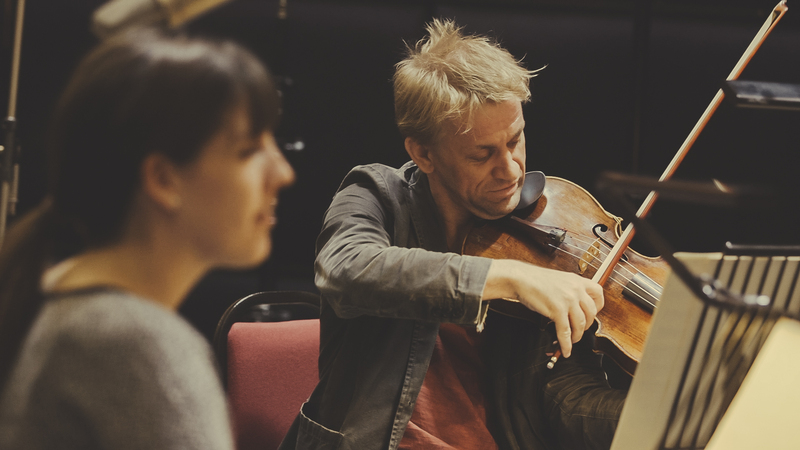 For many recordings, particularly in film, refining the music in this way is often lost due to time limitations and the music suffers as a result, so, even with our meagre recording timeframe, refining the music through rehearsal was something that absolutely had to happen. Sectional rehearsals and lengthy Skype conversations about interpretation, tone colour and phrasing where the answer to this. This is nothing new by any stretch of the imagination, but it is interesting to note that rehearsals and communication are some of the first things to get cut from time-scarce recording sessions; just ensuring there is time ahead of the recording to work on these things will contribute significantly to the ease of the session, if for no other reason than putting the performers at ease with the music. The day was broken into sections, with piano in the morning, followed by strings, brass and then percussion. While our longest session for the performers was four hours, behind the desk the recording session was 14-hours straight, as we re-amplified the guitar during the first two one-hour breaks and our final break was dedicated to setting up the percussion, which included five tuned gongs of gargantuan size, vibraphone, crotales, bass drum and tubular bells. It was a monster of a session, but with careful planning and some of the finest musicians in the UK, we recorded something pretty damn special. The next instalment will be the last to cover the making of Islandia ahead of its release. I’ll be talking about the mix process and hinting at where things go after that. I’ve a couple of really interesting commissions coming up later in the month and they will be the focus of my writing in the coming weeks.